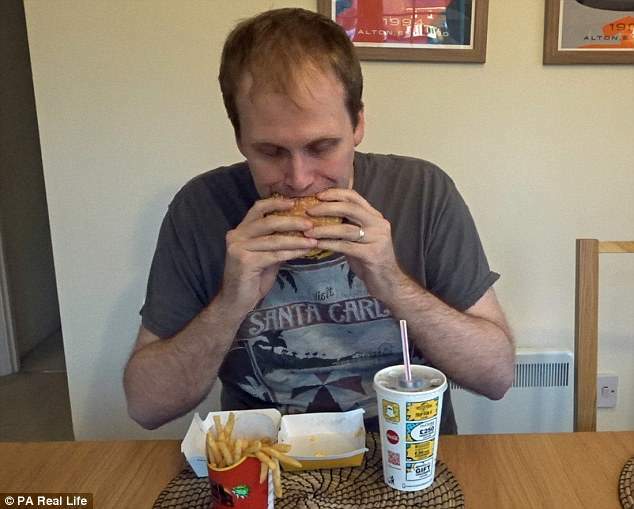 A British YouTuber who underwent his very own Super Size Me-style experiment – eating nothing but McDonald’s for an entire week – was astonished to find he actually lost weight. 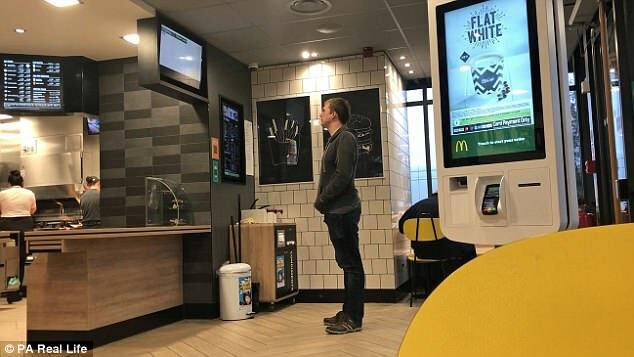 Mike Jeavons, 33, from Leighton Buzzard, Bedfordshire, dined at the fast food restaurant 21 times between 21 and 28 March this year – snacking on everything from bacon and egg McMuffins to quarter pounder cheeseburgers – spending around £99. And when weighing himself at the end of the week Mike was astonished to discover he had lost 5lbs. 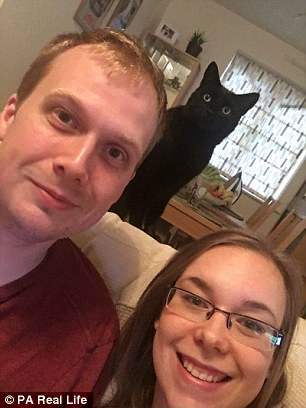 Explaining how he first got the idea, YouTuber Mike, who lives with his team leader wife Grace, 28, said: ‘I’ve done a few week-long eating challenges in the past and I’m always thinking about what I can do next. ‘I’ve done a week on baby food, a week on canned food, a week on Iceland frozen food, which involved eating some crazy stuff like chicken tikka lasagne. 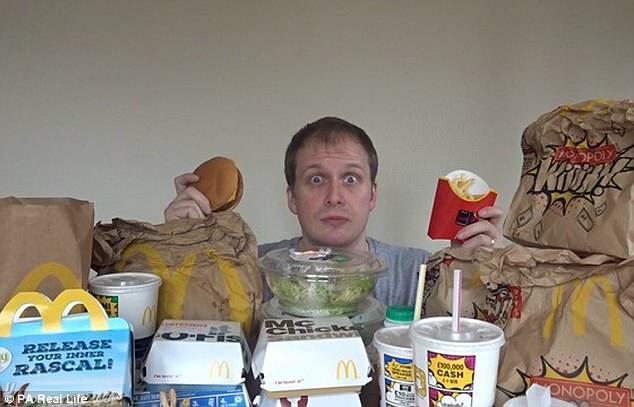 So, after watching the documentary Super Size Me earlier this year – in which filmmaker Morgan Spurlock only eats McDonald’s food for 30 days, charting the drastic effects on his body – Mike decided to stage his own version of the challenge. He continued: ‘I thought the documentary was a little sensationalised. If you’re eating about 5,000 calories a day, then of course you’re going to put on weight and find your well-being affected. Endeavouring to keep a food diary, recording the nutritional value of everything he ate, Mike began his challenge last month. At first, Grace joined in – but ‘had enough’ after a few days, according to her husband. Mike explained how breakfast was not too much of an issue, as he rotated eating muffins, bagels and porridge. But, usually opting to have a light meal, he said he struggled with lunch. ‘I knew I’d be having a big burger for dinner, so I wanted to stick to something like a salad or wrap,’ he said. ‘But I’d get these major energy slumps afterwards. ‘Then, by the time I had dinner, I’d feel almost euphoric afterwards. It was like a drug. Although he flitted between a couple of different branches, Mike said he still received odd looks from staff for going in multiple times each day. By day three, he began having stomach problems, due to all the fat he was consuming – which he believes was exacerbated by the fact he was washing it all down with fizzy zero-calorie drinks. ‘To keep everything in line with the recommended daily allowances, I had to save calories where I could,’ he said. ‘Because I was eating so much fat, zero-calorie drinks were a saviour – though they did make me feel ill after a while. As the week neared an end, Mike began craving healthy food – eyeing his wife’s freshly-cooked dinners with envy. 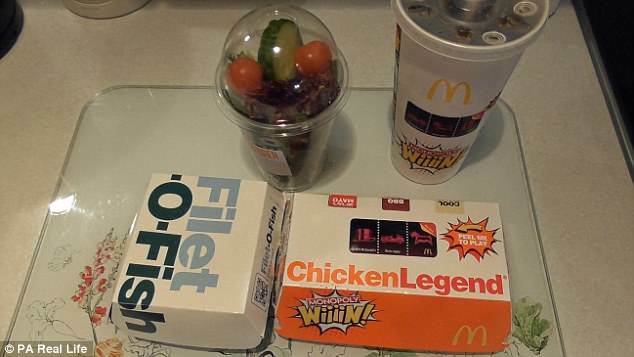 But, by way of a goodbye tour, he ensured he saved his largest meal – a quarter pounder with cheese – for last. Weighing himself at the end of the week, he was astonished to find he had shed 5lbs, going from 15st7lbs to 15st2lbs. Uploading the experiment to his YouTube channel, he was met with a flurry of positive comments from fans. ‘People think it’s great, and are asking what I’m going to do next,’ he said. ‘I’ve had a few comments saying they wish I’d pushed it further and done a month, like the real Super Size Me, but that’s been done. You can’t please everyone. 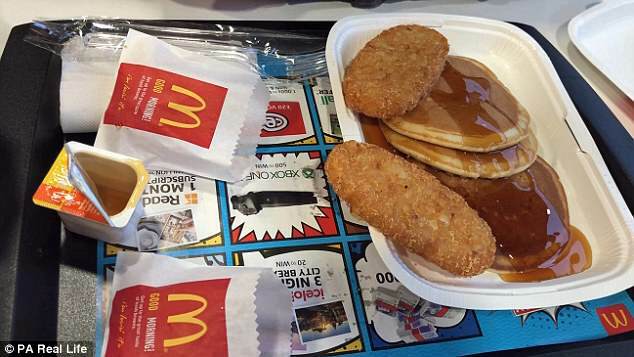 ‘This has shown me you can eat a weeks’ worth of McDonald’s – even though they’ve never advised you do that themselves. There’s a chance to try new things. I think I’ve been through the whole menu now.